With the unofficial end of Summer just a few days away, I thought I would start the transition to Fall gently. With candy. Apple flavored candy. Oh yeah, and it's super tart. I've been dying to make a fruit chew candy for months, but I had to wait for the right weather to do it. Hot and humid days aren't the best when you're trying to work with a slab of sugar. Last week I was treated to a lovely dry day in the mid-70's and the candy thermometer was freed from it's storage location in the candy bin. 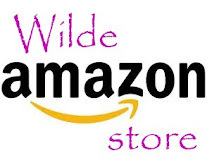 First - be sure to drop by Wilde in the City to see if you won the Stitch Fix Skirt giveaway!!! When you think of fruit chews (I'm talking Starburst type candies here), apple probably isn't the first flavor to come to mind. I knew that I wanted these candies to scream Fall and I wanted to put my container of citric acid to use. Sour apple candies were the perfect combination. 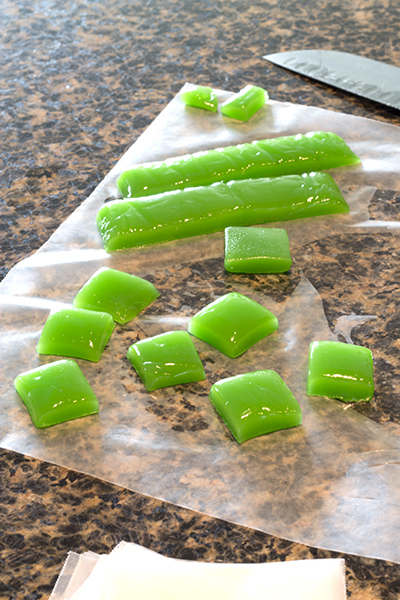 I tossed in some mint green food coloring and was rewarded with a slab of bright green chewy candy. The trickiest and most tedious part of making a soft candy like this is the last step - wrapping. Since the candies would just melt back together if you place them in a bin together, you have to wrap the individual portions in wax paper. This time I cut the candy into 1-inch squares (to mimic the classic candy shape), though I think next time I'll go for more of a log shape (like a tootsie roll!). Now I have a candy jar full of these tart sweets. I need to get a new job so I can share my candy creations with my new coworkers! Hello prospective employers! I'll bring you treats! I'm such a good employee. This is one of the easier candies I've made in a while. It even came up to temperature pretty quickly! I used one or LorAnn oils candy flavorings because it is highly concentrated and doesn't add too much extra liquid to the hardening candy. If you use an extract rather than an oil, you'll want to use about 1 teaspoon of the extract. Line a 9x5-inch loaf pan with aluminum foil. Coat foil with a light layer of cooking spray. Gently wipe out excess oil with a napkin. Combine butter, corn syrup and sugar in a 2-quart pot. Stir to moisten the sugar with the corn syrup. Bring to a boil over medium-high heat. Clip on a candy thermometer and continue to heat, stirring occasionally, until the temperature comes up to 248 ºF. 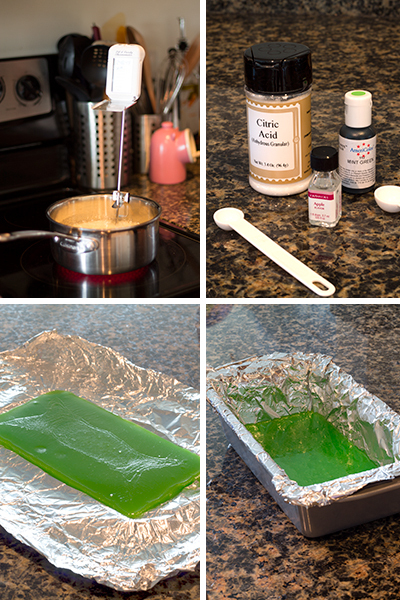 Remove sugar syrup from the heat and stir in candy oil, citric acid and food coloring. Pour the now green syrup into the prepare pan. Let sit undisturbed until completely cooled and hardened (about 1 hour). Remove candy from the pan and peel foil from the back. Using a sharp knife, cut candy slab into 1-inch pieces. 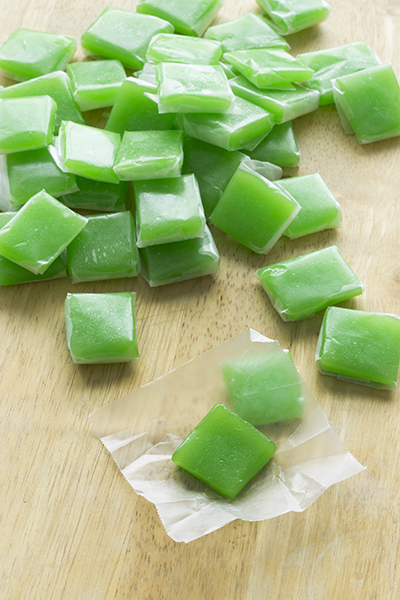 Wrap in wax paper and stir in an airtight container at room temperature. Candies will keep for about 1 month.